1989-09-05. New. Ships with Tracking Number! INTERNATIONAL WORLDWIDE Shipping available. Buy with confidence, excellent customer service! New York: Macmillan Publishing Co., 1989. The story of Ray Chapman of the Cleveland Indians, a popular player struck in the head and killed in August 1920 by a pitch thrown by Carl Mays of the New York Yankees. Mr. Sowell's book investigates the incident and probes deep into the backgrounds of the players involved and the events that led to baseball's only death at bat. A New York Times Notable Book of the Year. "Splendidly researched and vivid as today . . . remarkable." - Roger Kahn. 330pp. Author's personalized inscription ffep. On many lists for being in the top ten of all baseball books, quite scarce signed.. Signed by Author. 1st Printing. Hard Cover. Near Fine/DJ Near Fine. Octavo. 2004-05-09. New. Ships with Tracking Number! INTERNATIONAL WORLDWIDE Shipping available. Buy with confidence, excellent customer service! NY: Macmillan; (1989) First printing of the baseball historian's first book, near fine in a fine dust jacket. The page edges are just faintly soiled. 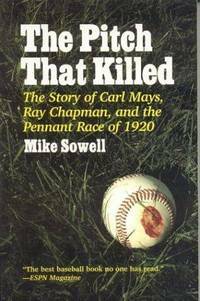 The story of a beanball thrown by Carl Mays of the Yankees that killed Ray Chapman of the Indians during the pennant race in 1920. Some b&w photos, bibliography and an index; 330 pages. Signed (signature only) by the author on the front endpaper in green ink, matching the color of the title on the jacket.. First Edition. Hard Cover. 1991-04-01. New. Ships with Tracking Number! INTERNATIONAL WORLDWIDE Shipping available. Buy with confidence, excellent customer service! 2015-04-07. New. Ships with Tracking Number! INTERNATIONAL WORLDWIDE Shipping available. Buy with confidence, excellent customer service! New York: Macmillan, 1989. First edition. 330 pp. 1 vols. 8vo. Green cloth and boards. Fine in fine dust jacket. First edition. 330 pp. 1 vols. 8vo. Macmillan Pub Co, 1989-09-01. Hardcover. Used:Good. 1989-09-05. Good. Ships with Tracking Number! INTERNATIONAL WORLDWIDE Shipping available. May not contain Access Codes or Supplements. May be ex-library. Shipping & Handling by region. Buy with confidence, excellent customer service! 2004-05-09. Good. Ships with Tracking Number! INTERNATIONAL WORLDWIDE Shipping available. May not contain Access Codes or Supplements. May be ex-library. Shipping & Handling by region. Buy with confidence, excellent customer service! John Wiley & Sons Inc. PAPERBACK. 0020747616 New Condition. . New. Ivan R. Dee, Publisher. PAPERBACK. 1566635519 New Condition. . New. 2015-04-07. Good. Ships with Tracking Number! INTERNATIONAL WORLDWIDE Shipping available. May not contain Access Codes or Supplements. May be ex-library. Shipping & Handling by region. Buy with confidence, excellent customer service! MacMillan Publishing Company, 1989. First edition. Hard cover. Very good in good dust jacket. Good+ jacket has some light edge wear. Bottom front board edge has small bump. Clean and unmarked inside and tightly bound. Text in Chinese, English. Sewn binding. Paper over boards. 330 p. Audience: General/trade. New York, New York, U.S.A.: Macmillan Pub Co, 1989. Minor corner bumping. Price clipped from the inner dust jacket flap. Gift inscription on the title page. Clean text. A very nice copy of this hard to find book.. First Edition. Cloth. Very Good/Very Good. Ivan R. Dee, 2003-12-23. Paperback. Used:Good. Macmillan Pub Co, 1989. Hard Cover - VG/VG - Other than replaced end paper book and dust jacket are clean and tight with light wear - Ex-Library - Library Rebind - Index - 330 pages.. Hard Cover. Very Good/Very Good. Ex-Library. New York: Macmillan Publishing Co.. Very Good+ in Near Fine dj. (c.1989). First Edition. Hardcover. 0-02-612410-6 . (price-clipped) [solid copy, minor soiling to page edges, light foxing on top edge; jacket has no significant flaws aside from the price-clipping]. (B&W photographs) The story of New York Yankees pitcher Carl Mays, who in 1920 became "the only major-league pitcher who ever threw a pitch that killed" -- the victim, in this instance, being Cleveland Indians shortstop Ray Chapman -- a player as popular and well-liked as Mays was feared and disliked. .
John Wiley & Sons Inc. PAPERBACK. 0020747616 Like New Condition. . Fine. Ivan R. Dee, Publisher. PAPERBACK. 1566635519 Like New Condition. . Fine. Macmillan Pub Co, 1989-09-01. Hardcover. Very Good. Hardcover w/dust jacket. Slight wear to jacket. Clean, unmarked text. Thanks for looking! Rowman and Littlefield, 2015 Book. New. Paperback. New and in stock. Macmillan Pub Co, 1989-09-01. First Edit. Hardcover. Very Good. John Wiley & Sons Inc, 1991-04-01. Paperback. Used:Good. New York: Macmillan Pub Co, 1989. The story of the most tragic on-field event in Major League Baseball history. On Aug. 16, 1920 Carl Mays of the New York Yankees threw a pitch that killed popular shortstop Ray Chapman of the Cleveland Indians. First printing. Gently bumped. Jacket lightly crimped, spine a bit sunned, in Brodart.. First Edition. Hard Cover. Near Fine/Very Good. Lyons Press. PAPERBACK. 1493017233 Special order direct from the distributor . New. New York, New York, U.S.A.: Macmillan Pub Co, 1989. Book. Fine. Hardcover. First Edition/First Printing. A square solid tight clean unread unused copy. This copy has just a hint of soil to the edges of the text block else fine. The priced jacket has some fading mostly in the spine area. THIS COPY IS IN MY POSSESSION AND NORMALLY SHIPS NEXT DAY. .
New York: Macmillan Publishing Company. Very Good in Very Good dust jacket. 1989. First Edition; First Printing. Hardcover. 0026124106 . Lyons Press. PAPERBACK. 1493017233 . New. Lyons Press. PAPERBACK. 1493017233 Remainder mark . Fine. Macmillan Pub Co, 1989-09. Hardcover. Good. Macmillan Pub Co. Used - Good. Former Library book. Shows some signs of wear, and may have some markings on the inside. Lyons Press. Paperback. 1493017233 LIKE NEW/UNREAD!!! Text is Clean and Unmarked! Has a small black line or red dot on bottom/exterior edge of pages. . Fine. 2015-10-01. Reprint. Ivan R Dee, 2003-12-23. Paperback. Good. John Wiley & Sons Inc, 1991-04. Paperback. Good. Macmillan Publishing Company, Incorporated, 1989. Hardcover. Acceptable. Disclaimer:A readable copy. All pages are intact, and the cover is intact. Pages can include considerable notes-in pen or highlighter-but the notes cannot obscure the text. The dust jacket is missing. At ThriftBooks, our motto is: Read More, Spend Less. Macmillan Publishing Company, Incorporated, 1989. Hardcover. Good. Disclaimer:A copy that has been read, but remains in clean condition. All pages are intact, and the cover is intact. The spine may show signs of wear. Pages can include limited notes and highlighting, and the copy can include previous owner inscriptions. At ThriftBooks, our motto is: Read More, Spend Less.Dust jacket quality is not guaranteed. John Wiley & Sons Inc, 1991-04. Paperback. Very Good. Softcover. There is writing on the first page inside the cover. Cover is in very good condition with normal shelf and use wear. Front cover has a light crease. Tight binding. Clean unmarked text. No highlighting or pen/pencil markings. We ship daily. John Wiley & Sons Inc. Used - Good. Former Library book. Shows some signs of wear, and may have some markings on the inside. Ivan R. Dee, Publisher, 2004-03-28. Paperback. Very Good. Ships Out Tomorrow! Collier Books, 1991. Book. Very Good. Paperback. 8vo - over 7¾" - 9¾" tall. Very-good condition soft cover book. NO remainder marks or clippings. Illustrated with photos. NO writing or tears inside book. 330 pages. Tight spine, clean pages. Covers show light wear - no tears. Pages show tanning. .
Ivan R. Dee, Publisher. Used - Good. Good condition. Owner's name on page edges. John Wiley & Sons Inc. Used - Good. Good condition. Ivan R. Dee, Publisher. PAPERBACK. 1566635519 Ships promptly from Texas. . Very Good. 2004.